You should have an Events or Calendar link in your main navigation bar, but if you don’t you can view your events at http://yourdomainname.com/event. Click “Events” on the left hand side menu. Fill out the Title and text editor with the description of your event, as you would if you were creating a news post or new page. Time & Date – Fill out this section with the Start and End information. Clicking on either date field will allow a datepicker box to appear. If the event is all day, just click the All Day Event box. Location – You can then fill out the location section with the event location information. Creating a Venue isn’t required, so you can move on to the next section if you’d like. If you have already set up an event before, you will be able to choose from the dropdown. Organisers – This is just like the location section, fill it out with the info you want – Or if you have already added an organiser you can choose this from the dropdown. Leave it blank otherwise. Event Categories – Just like posts, you can categorise your events by creating categories. Just click the blue “+ Add New Event Category” button, add a name from the new category and a parent (if you wish) and then click “Add New Event Category”. You can click preview at any time to see how your event will look. Once you’re happy with the way your event is looking, don’t forget to click “Publish”. 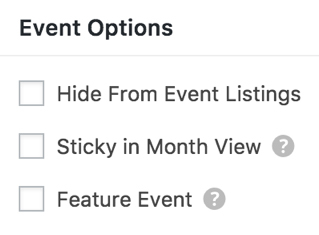 If you want to link to your event via an email or a menu, but don’t want it to be included in the main events views tick the “Hide from Event Listings” box. If you have more than one event on the same day (Month view shows a max of 3 events) – you may need to make sure one specific event is always at the top. Just tick “Sticky in Month view”. Use the “Feature Event” option to highlight important events on your other pages.